There was a time when you could find tons of great projects in states like South Dakota, Wyoming, and Montana. 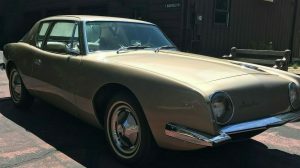 While these states get fair amounts of snowfall, they are arid enough climates that classic cars tended to survive quite well. Unfortunately, that means they’ve been picked clean. 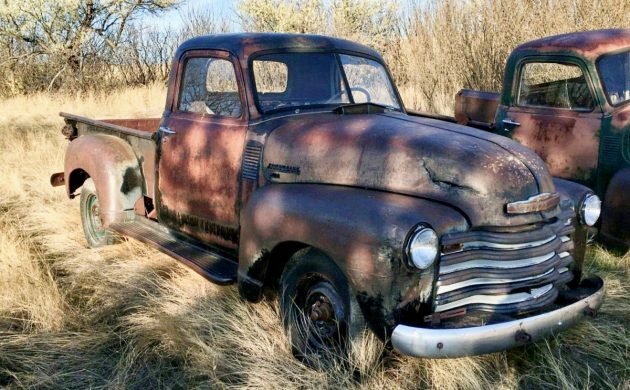 This sweet Chevy Advanced Design truck happened to be found in Montana and has managed to survive farm life, countless winters and pickers! 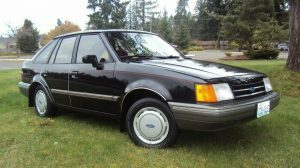 It’s got some dents and dings, but is incredibly solid and has a killer look. You can find it here on eBay in Billings, Montana with a current bid of $2,025 and no reserve. It appears that this truck was a field find. There’s no word on how long it was parked outside, but if this truck had been left out somewhere less arid it would probably have lots of rust in the cab corners and rear fenders. 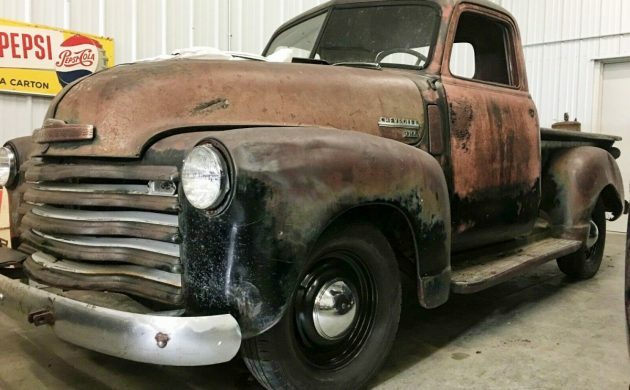 The “patina” look isn’t for everyone, but if that’s your thing, this truck would be a great rig to build into a rat rod. The Stove Bolt six-cylinder engine is still under the hood but doesn’t currently run. 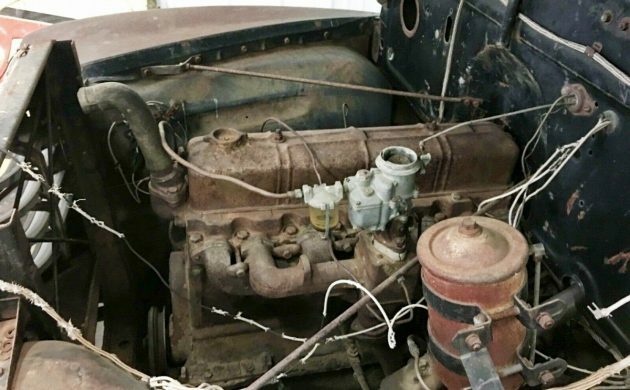 There’s a good chance it could be made to run without a full rebuild. If you are planning on daily driving it, you may want to consider upgrading it with a 350 V8 though. 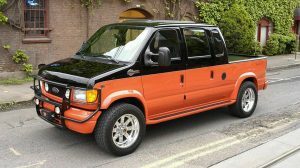 With a V8, a new interior and a slightly lower stance, this would make for one sweet shop truck! Trucks like this one are really appealing to me. For one, I grew up in Wyoming and use to see trucks like this all the time (sadily those days are long gone). I also like the fact that you have infinite options with it. You can rat rod it, turn it into a show-stopping street rod or give it a full restoration back to original condition. 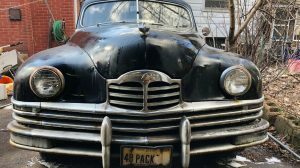 While I’d be inclined to keep the patina and rat rod it a bit, it will be up to the next owner to decide what to do with it. So, what route would you go with this Chevy? Now this is a bit more work than the previous GMC. Still a good starting point, but almost too far gone, and since it will come apart anyway, will probably become a resto-mod. My daughter and I looked at this last year before it was brought inside, I recognize the photo of it outside. The guy wanted $500 for a pair of them at the time. I passed because this was the better one but the motor was seized solid and way too much missing on the truck. Looks like it’s got a new set of tires since then though. Best of luck to the new owner. It fits the agricultural theme right, down to the rips from a plow piercing through its hood! The patina looks great , however I wonder how it will look after one has torn things apart to make this rig roadworthy again.It’ll probably need a new wiring harness ,switches,upholstery and replacement of all missing parts – all those shiny new bits reduce the patina look one by one. 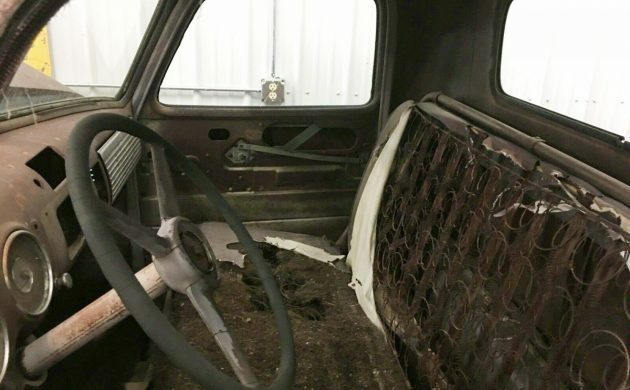 I love it has the 4spd and the low price – may I suggest new owner to utilize old web grain bags for upholstery material…?